A friend commissioned me to do a summary of this final volume in the series, when its US release was cancelled after six volumes. 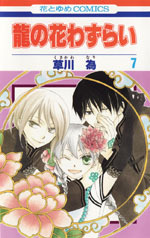 It is being scanlated (and since it took me a year to find time to finish this, much to my dismay), and volume seven is almost halfway done, but perhaps there are those who would just like to read the summary, or who would like to read ahead to the end of the series before the scanlators finish the final chapters. Anyway, here it is. I had never heard of this series before I got the request, but ended up really enjoying it and definitely recommend it. You can find more info about the series on Baka Updates, as well as links to the scanlation group who are working on it. Beneath the cut is a detailed summary of Ryuu no Hanawazurai vol. 7 by Kusakawa Nari. Don't click through if you don't want spoilers. Download the raw here.